Yesterday, we visited the mogote region of northern Puerto Rico, and Elise (a.k.a., La Pequeña Saltamonte) saw her first giant anole, Anolis cuvieri. As is the case for many "Pequeña Saltamontes," she is becoming more and more hypnotized by the mystery of anoles. I am willing to go out on a limb and let all her friends know now that scorpions are a thing of the past. 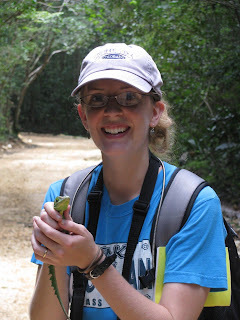 Once you hold a giant anole in your hands, there is no turning back. She is also becoming quite skilled at using the spectroradiometer and has moved from collecting radiance measurements inside the forest to collecting data on dewlap spectral properties. This is a major step and little does she know that now is when the fun is about to begin. At the current pace, she should be an expert before our trip is over.